Carson, CA, USA: Super Feather: Ryan Garcia (15-0) W PTS 10 Jayson Velez (26-5-1). Middle: Gary O’Sullivan (28-2) W RTD 3 Berlin Abreu (14-2). Garcia boxes his way to impressive unanimous verdict over more experienced Velez. Garcia had a good degree of height and reach on his side and used those to score on Velez who for forced to try to get inside to work. Garcia either blocked Velez punches or tied him up inside and picked up points with his jab. He scored with a good left hook late in the first and Velez replied with a right. Garcia used right hand counters to take the second and third and although Velez continued to press in the fourth he was finding it hard to get close enough to land much and Garcia was scoring with his jab, straight rights and right uppercuts. Garcia’s hands speed and movement left Velez swishing air in the fifth whilst being caught with hooks and uppercuts and Garcia also took the sixth with a cut opening over the right eye of Velez. Garcia started the seventh pumping out his jab and then scored with a sneaky right. However Velez continued to roll forward got past the jab more and looked to have outworked Garcia. Over the eighth and ninth Garcia stayed on the outside for much of the time scoring with the jab and right counters and he held off a last round effort from Velez to emerge the clear winner. Scores 99-91 for Garcia from all three judges. The talented 19-year-old, the WBO No 10 wins the vacant WBC NABF and WBO NABO titles and continues to look a great prospect. If there is a fault then it is a lack of upper body and head movement but his height and quick reflexes have been enough to hide that fault. Puerto Rican Velez, 30, had rebounded from a run of four losses in a row with wins over unbeaten Alberto Mercado, Giovanni Caro and former two-division WBO champion Juan Manuel Lopez so a serious setback for him here. O’Sullivan gets an inside the distance win as the over-matched Abreu retires after the third round. The Irishman was hunting down Abreu over the first two rounds pressing hard getting through with heavy punches and forcing Abreu to fight with his back to the ropes much of the time. Abreu did show some life earl in the second landing a few good punches but soon O’Sullivan was back in charge. In the third O’Sullivan kept up the pressure with Abreu just trying to survive. He spit out his mouthguard late in the round and after the bell his corner pulled him out. The 33-year-old “Spike” lost to Billy Joe Saunders for the vacant WBO title in 2013 and to Chris Eubank in 2015 but a seventh round kayo win over Antoine Douglas in December now sees him rated WBO 5/WBA 9/WBC 11. He was anxious to take Saul Alvarez’s place against Gennady Golovkin but will now have to wait and see if another big fight comes his way. Puerto Rican Abreu came in at only a couple of weeks notice and although he had won his last seven fights he caved in under the pressure from O’Sullivan. Walsall, England: Middle: Jason Welborn (23-6) W PTS 12 Tommy Langford (20-2). Heavy: David Allen (13-3-2) W TKO 4 David Howe (14-9-1). Welborn ignores the odds and wins the British title with a split decision in a hard, close and entertaining fight. Langford used his longer reach to get his jab working in the first. He then had to cover up under a furious attack from Welborn before rebounding at the end of the round landing to the body from both hands. Langford again worked well behind the jab early in the second. He landed some more hooks to the body and looked in control until a vicious left hook to the chin unhinged his legs. He dropped into the ropes which stopped from going down and the referee rightly gave him standing count. After the count Langford was desperately clinching to try to clear his head. He was shaken by a right uppercut but was firing shots of his own at the bell. Langford boxed well at the start of the third but again took a heavy right to the chin and a left to the body as Welborn ended the round strongly. Although he was rocked again late in the fourth Langford did enough work early to take the round. Welborn scored well to the body in the fifth only for Langford to score with flashing combinations to earn the sixth. Langford was pumping his jab and thumping to the body in the seventh. Welborn was landing the heavier punches but Langford was landing more and in the eighth was showing more variety in his work. They both had good spells in an all-action ninth of what was turning out to be a gruelling close contest. There were signs of tiredness in both fighters in the tenth but some rights to the head from Welborn just gave him the edge. Langford was still pumping out punches in the eleventh but there was little power in them and it was Welborn who was landing the eye-catching hooks and uppercuts. It was head to head and toe to toe for the last three minutes and Welborn just had that bit more in the tank. Scores 114-113 twice for Welborn and 115-113 for Langford but the result could have been reversed or it could have been a draw and no one would have had grounds for complaint it was that close. Welborn is the new British champion after losing to Frankie Gavin and Liam Smith in other British title fights. He was a big outsider in the betting but his power aggression and strength took him to victory. This is a big set-back for Langford. He had rebuilt well after being stopped in April last year by Avtandil Khurtsidze for the interim WBO title scoring an impressive win over Jack Arnfield in February this year to win the British title and was expected to win this one so he has some rebuilding to do again. “White Rhino” Allen was just looking for a few rounds of work and a pay day here as he again faced former victim Howe. He had knocked out the 6’8” (203cm) Howe in two rounds in March last year but this time Howe came within 20 seconds of lasting the distance when the fight was stopped. Allen lost on a split decision and fought a technical with Lenroy Thomas in fights for the Commonwealth title and will be hoping to get a shot at new champion Joe Joyce. Eighth loss by KO/TKO for Howe. Woden, Australian Capital Territory: Middle: David Toussaint (13-0) W PTS 10 Gunnar Jackson (27-11-4). Good win for the local fighter as he outboxes tough Jackson to win the vacant Australasian title. The visitor sprang an early surprise as after boxing orthodox in the first he switched to southpaw half way through the second. Toussaint, a southpaw himself, was thrown by the manoeuvre and badly rocked by a big left. He made adjustments and won all the way after that. Jackson was hampered by a cut that was opened by a clash of heads in the sixth. It was a bad cut but Jackson passed the ringside physicians examination and the fight went to the final bell with Toussaint a clear winner by unanimous decision. Already the Australian champion Toussaint will be looking to move on and up. New Zealander Jackson, 31, had a big edge in experience having gone the distance with Anthony Mundine and Ryota Murata but he was well beaten here. Elder brother Khuseyn makes it a family double as he stops Argentinian Villalobos in six rounds. The pattern for this one was set in the first as Baysangurov floored Villalobos with a body punch late in the round. Villalobos made it to the bell but was under pressure from then on. His cause was not helped by some low punches from Baysangurov but really Villalobos was never in the fight. Over the fourth and fifth Villalobos attempted some blatant butts and got away with them but he was totally exhausted and taking punishment when his corner threw in the towel in the sixth. Baysangurov, 23 was defending his WBA Continental title for the second time and the IBF International title for the first time. First loss inside the distance for Villalobos who loses when he tries to step up and all five of his losses have come against unbeaten fighters. Young prospect Gadzhyiev demolishes experienced Veron inside two rounds. Gadzhyiev bombarded Veron with punches over the first three minutes and then put him down with a combination to the head in the second. Veron made it to his feet but was wobbling badly and his corner threw in the towel. The tall 20-year-old Ukrainian, who turned pro at 17, was defending his WBC Youth title. As an amateur he won gold at the European Junior Championships and gold at both the World Junior Championships and the World Youth Olympic Games tournament. Naturally expectations were high but in his second pro fight he appeared on the Deontay Wilder vs. Artur Szpilka show in New York 2016 and lost to unbeaten Uzbek Botirsher Obidov… He is now 6-0-1 in his last 7 but the jury is still out on how he will fare as a pro. Now eight losses by KO/TKO for the former Argentinian super welter champion Veron. Saint-Nazaire, France: Light Heavy: Pierre Hubert Dibombe (15-0-1) W PTS 12 Elio Heraldo Trosch (14-7-2). Super Welter: David Papot (22-0) W PTS 10 Fouad El Massoudi (14-11). Dibombe collects the vacant WBA Inter-Continental title with unanimous decision over Trosch. Both fighters started cautiously and showed good technique. Dibombe had built a lead by the end of the sixth and then took over completely having a good eighth round. Trosch tried hard to turn the fight his way but Dibombe varied his attacks and was the more accurate. Scores 118-110, 117-112 and 117-111 for Dibombe. The 26-year-old from Nantes is French champion and ready to move up to tougher opposition. Argentinian Trosch, 29, a former national title challenger is now 3-2-1 in his last 6 fights. Fighting in front of his home fans Papot makes a successful second defence of his French title. Despite his mediocre record El Massoudi gave Papot some anxious moments early in the fight as he hustled and harried Papot relentlessly and a left hook in the third sent Papot tumbling into the ropes. El Massoudi was cut over the right eye in a clash of heads but survived a physician’s inspection. Papot slowly brought his superior skills to bear and from the sixth onwards used his speed and accuracy to put the fight out of the challenger’s reach. El Massoudi pressed hard to the end but Papot was the winner. Scores 97-93 twice and a harsh 98-92 all for Papot. The 27-year-old southpaw was making the second defence of the national title. He is No 16 in the EU ratings so will be looking to challenge for the EU title and then go on to get a shot at the European title. El Massoudi has now lost 6 of his last 7 fights. Christchurch, New Zealand: Welter: Bowyn Morgan (16-1) W KO 8 Andres Rodriguez (9-7) Home town fighter Morgan makes it nine wins in a row as he beats Rodriguez. The visitor from Mexico absorbed heavy punishment but kept fighting back. He was slowly ground down by punches to head and body from Morgan and was badly shaken in the sixth and seventh. Morgan finally ended it in the eighth. A series of punches put Rodriguez down and although he beat the count he was floored again and counted out. The 29-year-old New Zealand champion from Christchurch was New Zealand amateur champion in 2011, 2012 and 2013 and was a quarter-finalist at the 2014 Commonwealth Games. His only pro loss came in 2016 against the current Commonwealth champion Kris George. Going in Rodriguez was having only his second fight in four years and his first for 11 months. This is his second loss by KO/TKO. Cuban Nunez beats Panamanian Nunez on a disqualification. The Cuban had lots of height and reach over the local and as a result the local fighter was piling in head down trying to get inside to work and he was warned for careless headwork in the first. The Cuban was catching the local with hooks as he advanced and forced the local to the ropes and worked him over. Local Nunez was warned again for his head work in the second as the fight became messy with too much holding and wrestling. . The Cuban was the one doing the cleaner work but in the third once again the local’s head banged into the Cuban’s face. Initially the referee deducted two points from the local but then he examined the Cuban and saw that he was now cut high over his right eye. The ringside physician examined the cut and advised the fight be stopped and the referee disqualified the local. The crowd were not happy and it was announced that there would be a return in July. Cuban Nunez, 23, who is based in Panama was twice a bronze medallist and twice a quarter-finalist in the Cuban championships and he wins the vacant WBA Fedelatin title. Panamanian Nunez “El Matematico” lost to Moruti Mthalane for the IBF fly title in 2012 and was beaten on a technical decision when he challenged Juan Carlos Reveco for the secondary WBA title in 2013. He had won 3 of his last 4 fights but was deservedly disqualified here. Big puncher Matute again shows his power as he overwhelms Martinez. The Venezuelan southpaw was stalking Martinez and loading up on every punch. One punch from Matute landed low and the referee stopped the action for a few seconds and then in a sneaky move Matute extended his right hand in apology and at the same time threw a straight left which shook Martinez. A big right sent Martinez stumbling and he only avoided going down by holding onto the ropes. The referee applied a standing count. When the action resumed a left floored Martinez and although he beat the count a series of head punches had Martinez reeling and the referee stopped the fight. The 25-year-old “Demolition Man” is living up to his nickname. He has 21 wins by KO/TKO including ten in his last ten fights with all of the endings coming inside four rounds. He was making the first defence of his WBA Fedelatin title and is No 15 with the WBA. Mexican Martinez was 8-0-1 in his last 9 fights but is strictly a four and six rounds prelim level. Duran is considered to be one of the best prospects in Panama right now. Fighting southpaw out of a very wide stance he was throwing bombs with every punch. He looked awkward and Castillo managed to land some good right counters. Duran just kept coming and in the fourth a couple of thudding body punches put Castillo down on one knee. Duran landed a punch when Castillo was strictly speaking down and an angered Castillo leapt to his feet as if to retaliate but another body punch left him bent double and as he failed to respond the referee stopped the fight. The 24-year-old Duran wins the vacant IBF Latino title with his fourth win by KO/TKO. Mexican Castillo had impressive looking credentials with 13 wins by KO.TKO, nine of them in the first round but eleven of his victims had never won a fight. Easy night work for Solis as he knocks out novice Ramos inside a round. Ramos launched some wild attacks with Solis trying to fend him off. Their heads clashed and Solis took a step back. The referee halted the action and took Solis to be examined by the ringside physician and after a lengthy examination the fight continued. A fired up Solis went after Ramos and floored him with a right. Ramos was up quickly and Solis took him to the ropes and pounded away until Ramos dropped to his knees. Again the Colombian was up quickly but Solis rushed forward and landed a right that hit Ramos on his left elbow and Ramos went down rolling in agony clutching his groin and the referee immediately waived the fight over. It was more than five minutes before Ramos got up but if someone hit him low it was not Solis and it looked more like Ramos took the easy way out. Solis a 36-year-old Panamanian-based Venezuelan was WBA super fly champion back in 2013 and although he beat IBF champion Daiki Kameda in a unification fight Solis had failed to make the weight and lost his IBF title. He put together a seven bout winning streak but then lost on points to Shinsuke Yamanaka in 2016 for the WBC title in a fight that saw both fighters on the floor. He lost a close controversial decision to Jamie McDonnell for the secondary WBA bantam title in November 2016 and a return match in November 2017 ended in a No Decision when McDonnell suffered a bad cut. Colombian Ramos had less than ten rounds activity in his record and should not have been put into a fight like this. Ekaterinburg, Russia: Super Welter: Dmitry Mikhaylenko (23-3) W PTS 10 Alex Sharonov (9-3-2). Super Feather: Mark Urvanov (13-2) W PTS 8 Feruzbek Yuldashev (12-4). With both fighters coming off a loss neither could afford to lose. As he had lost two fights in a row against novice opponents the once-World rated Mikhaylenko needed the win most and achieved it. No cautious opening for these two as they both looked to dominate from the outset and stood and swapped punches in ring centre. Neither was giving much thought to defence and it provided an entertaining fight with action all the way. As the fight went into the middle rounds Mikhaylenko began to take over. His work rate was higher and his defence sounder. Sharonov was reduced to single shots with Mikhaylenko firing combinations and over the closing round Sharonov spent more and more time with his back to the ropes but he continued to compete hard to the final bell with Mikhaylenko taking the unanimous decision. The 32-year-old “Mechanic” Mikhaylenko ended a successful amateur career with 264 wins in 311 fights and when he turned pro won his first 21 fights scoring wins over Sechew Powell, Ronald Cruz, Johan Perez and Karim Mayfield to lift him into the world ratings. However a run of three losses in four fights put his future under question and he will be hoping to build on this win. Sharonov, 27, was 3-1-2 in his last 7 fights against domestic opposition. Urvanov was coming off a loss which snapped a twelve bout winning run but he won this one well to get back on track. He had height and reach over Yuldashev who is small for a super feather, and Urvanov used that advantage to outbox the Uzbek fighter. Occasionally Urvanov went off plan which allowed Yuldashev some success but when Urvanov went back to boxing he was in charge. He had Yuldashev in trouble late in the fight but the Uzbek refused to crumble and Urvanov had to settle for the unanimous verdict. The 21-year-old “Canelo” won some district and regional titles as an amateur and had picked up the Russian title and also the WBC Eurasia Pacific, WBC Asian Boxing Council and WBO Asia Pacific titles in his run of twelve wins so will now set out to win a few more titles. Yuldashev had won his last two fights but was physically overmatched in this one. Derby, Derbyshire: Light: Myron Mills (12-0) W TKO 4 Marcus French (15-4). Mills wins the vacant English title with stoppage of French. Mills had huge advantages in height and reach over the 5’4” French and that plus the harder punch was enough to give the home town fighter victory with the fight being stopped after Mills scored a heavy knockdown in the fourth. Sixth win by KO/TKO for the 22-year-old Mills including a good domestic victory over 18-2 Luke Paddock last year. French was 7-1 in his last 8 fights with the loss being to the very useful Robbie Barrett and this is his first loss by KO/TKO. Carson, CA, USA: Middle: Gennady Golovkin (38-0-1) W KO 2 Vanes Martirosyan (36-4-1). Super Light: Ryan Martin 22-0) W PTS 8 Breidis Prescott (31-13). Super Light: Ruslan Madiev (12-0) W PTS 10 Jesus Perez (21-1). Not much of a surprise here as Golovkin blows away a fattened-up and rusty Martirosyan inside two rounds to retain the WBA, WBC and IBO titles. Golovkin opened the round with a blazing right cross which had Martirosyan on skitter legs. He held on desperately and Golovkin swung him around and with Martirosyan badly shaken and off balance he dipped with his left knee touching the canvas. It was not a knockdown and Golovkin was pacing forward trying to land his right again with Martirosyan retreating and throwing jabs. Martirosyan looked to be recovering but then was nailed by two big rights which sent him to the ropes and Golovkin landed a left and a right and added another right as Martirosyan slumped to the floor where he lay face down and was counted out. It was pointed out that this was the twentieth title defence of the middleweight title for Golovkin equalling the 20 by Bernard Hopkins but if you do that then you are counting his ten defences of the secondary WBA title as he was not elevated to super champion until June 2014. Irrespective of that it gives the 36-year-old Kazak win No 34 by KO/TKO and it is now 13 years since he last lost a fight. That was to Egyptian Mohamed Hiklal in the preliminary round of the World Championships in 2005. He has said he is no longer interested in Saul Alvarez but that is surely too big a fight to let slide. Martirosyan’s was a lost cause from when the fight was first mooted and so it proved to be. He is really a super welter and he should return there. Despite almost two years without a fight he was No 1 with the WBC so it remains to be seen whether they penalise him for stepping in at such short notice and providing them with a sanctioning fee. Martin remains unbeaten with unanimous decision over fading veteran Prescott. He put Prescott down with a body punch in the fourth it looked legal but it was not counted as the referee decided it was low and Prescott was given some recovery time. He needed more time later in the round when Martin did land one below the belt and was deducted a point. Martin made that lost point up in the fifth flooring Prescott but the Colombian survived. Martin emerged a comfortable winner on scores of 79-71 twice and 77-73. The 25-year-old High School graduate from Chattanooga (as a Glen Miller fan naturally I have been there to see the actual Cho Cho) is a former USA Under-19 champion and US Junior Championships silver medallist. He has useful wins over 17-1 Bryant Cruz and 20-2 Francisco Rojo. Prescott, 35, has now lost 5 of his last 6 fights. I guess he will always be remembered for his 54 second blow out of Amir Khan in 2008. Madiev comes out on top in the contest between unbeaten fights with a comfortable decision over Mexican Perez. Scores 97-93 twice and 99-91. The 25-year-old Kazak, a stable mate of Golovkin, is a former Kazak Youth champion who competed at the World Youth Championships. He had too many good moves for the raw Perez who turned pro at 18 and has crammed 22 contests into two years as a pro and has a good win in Canada over David Theroux. London, England: Heavy: Tony Bellew (30-2-1) W TKO 5 David Haye (28-4). Bantam: Emmanuel Rodriguez (18-0) W PTS 12 Paul Butler (26-2). Super Feather: James Tennyson (22-2) TKO 5 Martin Joseph Ward (19-1-2). Heavy Joe Joyce (4-0) W TKO 2 Lenroy Thomas (22-5-1). Super Middle: John Ryder (26-4) W KO 2 Jamie Cox (25-2). Light Heavy: Joshua Buatsi (6-0) W TKO 5 Stephane Cuevas (8-2-3). Super Feather: Jordan Gill (20-0) W PTS 6 Carl McDonald (3-2). Super Light: Luke Campbell (18-2) W TKO 5 Troy James (20-6-1). 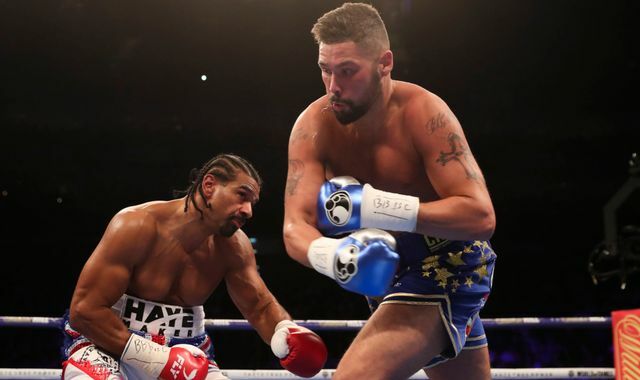 No controversy and no injuries as Bellew gets fifth round stoppage of Haye. Bellew was content to be on the back foot with Haye stalking him. Haye landed a fast left right to the head showing impressive speed. Haye continued to probe with his jab and landed a sharp right. Bellew went on the offensive over the last 30 seconds but did not land anything of consequence. Haye was on his toes dancing with his left down at thigh level. Bellew landed a good left hook to the body. Haye came forward throwing punches and backed Bellew into a corner and then stepped back to the centre of the ring inviting Bellew to come forward out of the corner. Bellew worked well with his jab for a while and with less than 30 seconds to go he nailed Haye with a left hook. That punch sent Haye back to the ropes and another left hook and a thunderous right dumped him on the floor. Haye was up at four and after the eight count with the bell had gone during the count the round was over. Bellew went onto the back foot early just stabbing out his jab. Haye was tracking him but not really throwing much. After two minutes of neither fighter doing much as Haye tried to move inside Bellew missed with a right but connected with a thunderous left hook to the chin that splayed Haye’s legs and sent him stumbling face down on the canvas. He was up at seven and assured the referee he was okay but he wasn’t. He was walking on water and as Bellew trapped him on the ropes and began to unload punches the referee stepped in and stopped the fight. This win puts Bellew right into a key position in the heavyweight mix and he was quick to call out Tyson Fury-but also Andre Ward for some obscure reason. There are other attractive fights out there for him after this high profile victory which puts him in a position where he can pick and choose who he fights next. Dillian White is unlikely to put his WBC No 1 rating at risk but Dominic Breazeale who is No 2 with both the WBC and WBO might be an option. Haye has not said he will retire but at 37 he is running out of time to find his way back to the top but he remains a name and if he decides to continue there are interesting fights there for him. Rodriguez wins the vacant IBF title as Butler misses the weight and has a near disastrous first round before being thoroughly beaten by the visitor. Butler was giving away height and reach but matching Rodriguez jab for jab until the Puerto Rican exploded with a lightning quick double left hook to the chin which put Butler down. Butler looked shaken but he was up at eight. Rodriguez came steaming in landing more left hooks driving Butler across to the ropes and the British fighter went down again. He was up quickly and moved and jabbed to the bell. Butler recovered well. He was jabbing and moving and throwing some quick combinations. A close round. Rodriguez did not throw much but did look dangerous. Rodriguez did the better work here. He was on the back foot but was quicker with his jab and scored with a pair of nifty combinations just before the bell. Butler was livelier in this one and opened up with a sharp right to the chin. Rodriguez then took over stabbing home his jab and getting through with his own right and he took the round. Another round for Rodriguez. He out jabbed Butler landed a peach of a left uppercut and landed some heavy rights over the last twenty seconds. Butler made a fast start to this round coming in behind has jab with hooks to the body. After that Rodriguez took over forcing Butler back with his jab and following the jab with a straight right and a left hook. Butler came to life again late but was stopped in his tracks by a straight right. A comfortable round for Rodriguez. He was able to score at range with his jab and land straight rights with Butler threatening but just not letting his hands go and again he was halted in his tracks by a stiff right. This one was closer as Butler came forward for much of the round and was letting his hands go. Rodriguez continued to slot home his jab and fire straight rights through the Englishman’s defence and edged the round. A better round for Butler. Perhaps his best so far. He came forward letting punches fly from both hands and scoring with some body shots. Rodriguez came to life over the last minute landing a couple of left hooks and Butler scaled down his attacks but had done enough early to take the round. Rodriguez round. He was darting out quick punches and then loading up hooks. He had enough time to do same dancing with hands down and although Butler put in an effort at the end of the round it belonged to Rodriguez. Rodriguez finished the fight strongly. He took Butler to the ropes a couple of times and dug in some hurtful left hooks and danced and jabbed his way to victory. The 25-year-old “Manny” wins the vacant WBO title. He had been waiting a long for the tile chance with a proposed eliminating fight with Omar Narvaez constantly being put back and Narvaez then choosing to go against Zolani Tete for the WBO bantam title. As a result this was only his second fight in 14 months so he will be looking to celebrate and then get back into action as soon as possible. Butler could not have won the title as he came in 3 ½ lbs over the division limit and after the disastrous first round he struggled to make any impression in the fight and it was a poor performance from the 29-year-old from Cheshire who won this same title by beating Stuart Hall in 2014. He then relinquished the title without defending it to go back down to super fly where he was beaten in eight rounds by Zolani Tete for the IBF title in 2015. He had won nine contests since then but this was one of his worst showing as a pro. This one was always going to be a battle between the power and aggression of Tennyson and the excellent boxing skills of Ward with Ward being a pre-fight favourite. Ward is a classy boxer and in the first he was jabbing slotting home quick rights and dodging or blocking the punches from Tennyson. The challenger knew he would be outboxed if he let Ward fight on the outside so he pressed hard but Ward’s speed and movement were impressive. Ward showed some top class defensive work at the start of the second but Tennyson did manage to get through with a strong right and after landing some eye-catching shots to head and body Ward landed a rib crunching left to the body that saw Tennyson drop to his knees. Tennyson was up at eight and the bell went. Ward landed a series of body punches at the start of the third but Tennyson just walked through them to work in close. In some ways the knockdown helped Tennyson as Ward was now confident enough to spend more time standing and trading and Tennyson drilled Ward with a right cross and banged home a hurtful left hook to the body. Ward started the fourth moving and boxing but Tennyson hunted him down and again got through with a heavy right and a left hook. Another left hook shook Ward and Tennyson piled on the pressure. Yet another left hook almost put Ward down. Only some smart defensive work and some holding kept Ward in the fight and just before the bell Tennyson landed a right and another blistering left hook. The fight had completely changed over the space of those last two rounds and now with his aggression and power Tennyson that was in the ascendancy. Ward moved more at the start of the fifth and then stood and landed some good punches but Tennyson pounded Ward with a series of head punches driving Ward back to the ropes and Ward slumped down to one knee. He was up at four and after the eight count got an unexpected breather as Tennyson had lost his mouthguard and was trying to pick it up and put it back in his mouth. When he managed that Tennyson marched forward and landed a couple of uppercuts with Ward falling into the arms of the referee who promptly stopped the fight. Huge win for The Northern Ireland “Assassin as he adds Ward’s European and Commonwealth titles to the WBA International title he already holds. He showed grit and determination to get up from that body punch in the second and then ground Ward down for his eighteenth win by KO/TKO. A shot at the WBA title later this year or early next is within his grasp. Ward had been dominant in domestic wins over Andy Townsend, Ronnie Clark, Maxi Hughes and Anthony Cacace before knocking out Spaniard Juli Giner for the European title in December. At 26 he has time to regroup but he needs to work out what went wrong here. Joyce steam roller’s Thomas to win the Commonwealth title in only his fourth fight. Joyce was shadowing Thomas in the first holding his hands low and really just looking to land a big punch. Thomas managed to land a couple of punches but Joyce kept coming. Joyce was making no pretence of boxing he was wading in swinging punches and trying to overwhelm the smaller and lighter Thomas. Joyce started to get through with some clubbing shots to the head and Thomas was in trouble. He tried desperately to hold but Joyce drove him back to the ropes and a vicious left hook to the ribs put him down. Thomas made it to his feet and as the bell had already rung he had managed to survive. Thomas was down early in the second but he had been bundled over and it was not a knockdown. Joyce marched forward landing hooks and uppercuts driving Thomas across the ring until Thomas dropped. He beat the count but Joyce continued to land clubbing punches with Thomas just trying to cover up and throwing nothing back. Finally he showed some fight but landed two low punches which looked suspiciously like an attempt to foul his way out of the fight but he was clipped on the jaw with a left and went down and was counted out. At 32 Joyce is in a hurry as this record breaking title win shows. There was nothing pretty about the crude but powerful punches Joyce used to obliterate Thomas and now he will be looking to add other titles. Although this was only his fourth pro fight he is a former Commonwealth Games and European Games gold medallist and Olympics silver medal winner in Rio so he is far from being a novice. Thomas was making the second defence of his Commonwealth title but the 33-year-old Jamaican was overwhelmed by the power of Joyce and has now lost four by KO/TKO. This was a battle of southpaw punchers and was never going to go the distance and Ryder came out on top to keep himself in with a chance of a shot at the WBA title. Both began by testing their southpaw jab with Cox taking the fight to Ryder but Ryder clipped Cox with a couple of short hooks inside and looked to just edge the round. Cox was taking the fight to Ryder again in the second landing a couple of overhand rights but as they both stood in the pocket a short right from Ryder landed high on Cox’s head. He took a couple of wobbly steps back and then tumbled over and landed face down on the canvas. He got up to one knee listening to the count but did not start to rise until nine and the referee showed ten fingers just as Cox stood up straight. It was a close run thing but the referee decided that Cox was a split second too late and Ryder was the winner although Cox protested. “The Gorilla” Ryder, 29, makes it two impressive inside the distance wins in a row following his fifth round kayo of Dane Patrick Nielsen in October as he moves to 14 wins by KO/TKO. Ryder made a name for himself when losing a paper thin decision to Billy Saunders for the British and Commonwealth titles in 2013. He did not really kick-on from there losing important fights to Nick Blackwell, Jack Arnfield and Rocky Fielding but the win over Nielsen saw him crash the WBA ratings at No 3 so he will be hoping he can get a title shot out of this impressive win and there is talk of a return with Fielding. This loss is a blow to Cox’s title hopes. After winning his first 24 fights the former undefeated Commonwealth champion was knocked out in four rounds by George Groves in a challenge for the WBA title in October and was hoping a win here could lead to another title fight. Gill keeps busy and stays unbeaten with a win over late substitute McDonald. Not surprisingly Gill won every round with the referee turning in a 60-54 score. The 23-year-old hails from Chatteris the same town as Dave Green the “Fen Tiger”. He has a good win over Jason Cunningham so this was just a keep busy outing. Dubliner McDonald is really a super bantam/ feather at most so did well to give Gill six hard rounds. Campbell was a late addition to the card and was looking to get some work following his split decision loss to Jorge Linares in September. He was much too big and much too fast for James and was able to box on the outside and catch James with counters when James lunged forward. He rocked James with a combination in the second and dropped him at the bell with a left hook followed by a right hook. James beat the count so was there for the third. Campbell rocked James again at the end of the third and a right floored James again in the fourth but the gutsy little James made it to the bell. Campbell drilled James with some straight lefts in the fifth and James did well to stay on his feet. Campbell continued to land hard punches to head and body and the referee stepped in to save James taking too much punishment. There is talk of Campbell, the WBC No 2, fighting his previous conqueror Yvan Mendy now the WBC No 1 to see who gets a shot at Mikey Garcia but with Campbell at No 3 with the WBA the outcome of the Linares vs. Vasyl Lomachenko may open another avenue for Campbell. Former British super feather challenger James has lost his last three 3 fights. Coronada, Argentina: Welter: Diego Ramirez (15-1) W PTS 10 Walter Castillo (12-2). Southpaw Ramirez floors and outpoints Castillo to retain the interim WBO Latino title. Castillo never stopped walking forward and he was caught time and again with hooks and uppercuts. A left hook put him down in the fourth and although he did well enough to take a round here and there he was continually being shaken by those short punches and looked close to going down again a couple of times. Ramirez won on scores of 98-91 twice and 99-90. This was the second successful defence for the 23-year-old and win No 13 on the bounce. He is the Argentinian No 4, Castillo, the Argentinian No 7 welter, was trying out at ten rounds for the first time. He had also been floored and outpointed in his last fight. Miramichi, Canada: Super Light: Logan McGuinness (25-1-2) DREW 6 Edgar Ramirez (17-13). Heavy: Dillon Carman (13-3) W KO 5 Carlos Carreon (7-5). Super Middle: Nat Miller (12-2-2) W PTS 8 Joaquin Murrieta (6-7-3).Heavy: Chris Norrad (16-0) W TKO 6 Hugo Lomeli (20-13-1). At one time McGuinness was looked upon as a future world title challenger and perhaps going that step further and winning a title. That possibility has disappeared as McGuinness has performed badly with a loss and a draw in his last two fights. The loss to Argentinian Horacio Cabral could be explained away but this draw with a very ordinary Mexican is a career low for McGuinness. Ramirez made it a tough fight and McGuinness ended with three cuts around his eyes and the sound of boos from the Canadian audience ringing out. McGuinness badly needs a win. Ramirez was 4-5 going into this one. This looked farcical as the 6’6” 196cm) Carman was faced by a 5’9” (175cm) Carreon. It took the former Canadian champion five rounds to wear down the chubby little Mexican with some of Carreon’s antics. amusing both the audience and Carman until the Canadian ended the fight in the fifth with a right.First fight for the 31-year-old “Big Country since losing his national title to Mladen Miljas in December. Second loss by KO/TKO for novice Carreon. Miller, a holder of one of the versions of the Canadian title, wins this one with a unanimous decision but has to struggle at the end. Miller swept the early rounds but tired and Murrieta staged a strong finish flooring Miller in the seventh but running out of time and unable to overcome Miller’s lead. Miller holds the Canadian Professional Boxing Council (CPBC) title and gets his third win in a row but is strictly domestic level. Murrieta is now 1-5-1 in his last 7 fights. In one of his rare ring appearances Norrad wears down and halts Lomeli in another farcical; match. This time it was not quite so much of a physical gap but still too big with Norrad 6’3” (190cm) and Lomeli 5’9” (175). Norrad had no trouble finding the target until with less than a minute to go in the fight Lomeli went down and had no interest in getting up. Eighth win by KO/TKO for the 34-year-old from New Brunswick but with just five fights in almost six years he needs to get serious about his career. Lomeli was having his second fight in ten months being inactive from 2013 until last year and all you need to know about his shape for this one is that he was 159lbs in 2013 and 231lbs here. Peterborough, Canada: Super Welter: Cody Crowley (14-0) W PTS 10 Kevin Higson (14-2). Crowley makes a successful second defence of his CPBC International title and also wins the Canadian title with convincing victory over fellow-Canadian Higson. The local southpaw was better than Higson in every department. He was faster, had superior hand speed and a more powerful punch. He took every round having Higson cut over his left eye and bleeding from the nose. Higson was badly rocked in the eighth and again just before the bell in the ninth but stayed there to the end. Scores 100-90 for Crowley from all three judges. Good win for the 25-year-old “Crippler”. Higson had won his last six. Tokyo, Japan: Feather: Tomoki Kameda (35-2) W PTS 10 Daniel Noriega (30-11-1). No sign of rust here as Kameda returns to action with a shut-out against tough Mexican Noriega. With height, skill and speed on his side Kameda outboxed Noriega in the first and then landed a left hook in the second which had Noriega dipping and as his glove touched the canvas it was counted as a knockdown. Kameda continued to pound Noriega with an array of punches to head and body and in the fifth and a left to the ribs floored Noriega for the second time. It looked as though Kameda night finish it early as piled on the punishment in the sixth but Noriega survived and despite a big effort by Kameda in the last he made it to the bell. Scores 100-88 for Kameda on all three cards. The 28-year-old “Mexicanito” was the first Japanese fighter to win a WBO world title when he beat Namibian Paulus Ambunda for the bantam title in 2013 following in the footsteps of his brothers Koki and Daiki to be the third of the brothers to win a world title. After relinquishing the WBO title he then lost in two stirring battles against Jamie McDonnell for the secondary WBA title. This is his fourth win since then and as he is rated IBF 3(2)/WBA 3/WBC 6 and WBO 10 at super bantam, he has a very good chance of getting another title shot. Noriega, 32, was 5-2 going into this one with the losses being to now WBA champion Daniel Roman and former WBC title challenger Ronny Rios. Merida, Mexico: Light Heavy: Manuel Ceballos (15-1) W TKO 10 Marlos Simoes (12-1-2). Ceballos retains the WBO Latino title and ends the unbeaten run of Brazilian Simoes. The Brazilian’s record had been built against some low level opposition and Ceballos was much too good for him. The local fighter dominated the fight all the way and Simoes was exhausted going into the last. Ceballos put him down with a series of head shots and although Simoes beat the count a combination to body and head put him down again and the fight was over. The 6’3” local makes it nine wins by KO/TKO and moves to 11 wins in a row. He was making the second defence of his WBO Latino title. First fight outside Brazil for Simoes. Before the fight the bell was rung twelve times to honour the memory of Rafael Mendoza a great boxing figure, an international matchmaker, a manager and a promoter who played a part in building Miguel Canto, Guty Espadas, Juan Herrera and Freddy Castillo and also Saul Alvarez before Alvarez became a big star. More recently he had been a member of the top drawer Azteca Boxing TV team. He will be sorely missed by all. RIP Rafael I wish I had known you longer and better. Tashkent, Uzbekistan: Super Middle: Azizbek Abdugofurov (11-0) W PTS 12 Dmitry Chudinov (21-3-2). Super bantam: Olimjon Nazarov (21-5) W PTS 10 Khvicha Gigolashvili (18-26). Abdugofurov returns home and delights his fans with a wide unanimous decision over Chudinov. The tall, slim Abdugofurov is not a puncher but he has a long reach and good movement and Chudinov just could not get close enough often enough to be any danger. Chudinov kept pressing and with Abdugofurov not having a lot of power he boxed on the back foot trying to stay off the ropes. He speared Chudinov on the way in and stopped to lash “The Night Wolf” with two-handed flurries. Relentless pressure won Chudinov a few rounds when he could cut off the ring and work on Abdugofurov on the ropes but other than that it was a frustrating night for the Russian. In the sixth Chudinov suffered a bad cut over his right eye which looked to come from a punch but he was allowed to continue. Chudinov chased in vain to the end but Abdugofurov was just too clever for him. Scores 118-110 twice and 118-111 for Abdugofurov. The Malaysian-based “AAA” wins the vacant WBC Silver title. He is quick and skilful but his lack of power will hold him back. Former interim WBA champion Chudinov made three defences of that title before being stopped in twelve rounds by Chris Eubank Jr in 2015. He was 7-1 in his last 8 fights with the loss being against Lolenga Mock in January this year. Fight of the week: Jason Welborn vs. Tommy Langford provided twelve rounds of action all the way. Honourable mention to the James Tennyson vs. Martin Joseph Ward the fight only went five rounds but it was a classic puncher vs. boxer contest. Prospect watch: Johan Gonzalez from Venezuela 15-0 all 15 by KO/TKO and 12 in the first round but untested yet.